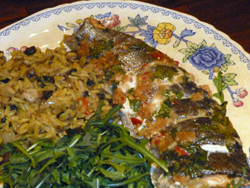 Pink trout fillets cooked with ginger, garlic & chilli make a stunning contrast with nutty black rice. 1. Make the rice. Heat the sesame oil in a pan and fry the mushrooms with half the spring onions for 2-3 minutes. 2. Add the rice and sliced ginger to the pan and stir well. Cover with the boiling water and bring to the boil. Reduce the heat, cover and simmer for 25-30 minutes or until the rice is tender. Drain well and cover to keep warm. 3. While the rice is cooking, preheat the oven. In a small bowl mix together the grated ginger, garlic, chilli and soy sauce. 4. 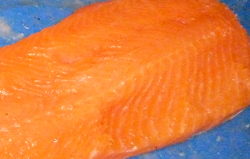 Place the trout, skin side up, in a lightly oiled shallow baking dish. Using a sharp knife, make several slits in the skin of the fish, then spread the ginger paste all over the fillets. 5. 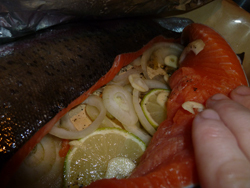 Cover the dish tightly with foil and cook in the oven for 20-25 minutes or until the trout fillets are cooked through. 6. Divide the rice between two warmed serving plates. Remove the ginger. Lay the fish on top and sprinkle over the reserved spring onions to garnish. Shown above is the original recipe. Visit Take Two Trout to see our version and how it turned out when we cooked it as part of '52 Rainbow Trout Recipes in 52 Weeks'.